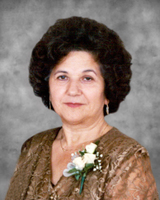 God called our dear mother, Caterina Disimino, peacefully on April 7, 2019. She is reunited with her beloved husband of 56 years, Carmelo Disimino. Caterina was a loving and devoted mother to Lucia (Giovanni) and Domenico (Virginia) and cherished nonna to Katerina, Kyra and Carmen-Jacob. She will be sadly missed by extended family and friends. Family and friends will be received at the Ward Funeral Home, 4671 Hwy 7 (west of Pine Valley Dr.), Woodbridge, on Tuesday from 5-9 pm. A Mass of Christian Burial will be held at Immaculate Conception Parish, 300 Ansley Grove Road, on Wednesday, April 10th at 11 am. Entombment to follow at Queen of Heaven Cemetery. As expression of sympathy, donations to the Heart and Stroke Foundation would be appreciated. Consider providing a gift of comfort for the family of Caterina Disimino by sending flowers. May the family of Caterina Disimino please accept my sincere condolences hoping you find comfort in God's words at Acts 24:15 and Psalm 37:29.